Earlier this week, the folks at Portland Opera invited a bunch of cartoonists and bloggers to attend dress rehearsal for their newest production, with complimentary drinks and food beforehand. I’ve had the pleasure doing this twice before* and each time it’s been great fun. Due to some bad planning on my part and a few mishaps at the hands of Tri-Met, I completely missed the eating and drinking portion of the evening and snuck into the backstage tour at the last minute. I was beginning to feel a lot like Candide myself. I scribbled like crazy during the rehearsal and returned home with about 9 pages of wildly incoherent pages. On the train ride I came up with a sort of synopsis image of the entire show and added this to my sketchbook. The next day a combed through my favorite doodles, traced them and added a bit of color. I probably would have done more if I had the time. I posted my favorite drawings to my flickr page. The Portland Opera’s production makes for lively fast-paced entertainment. 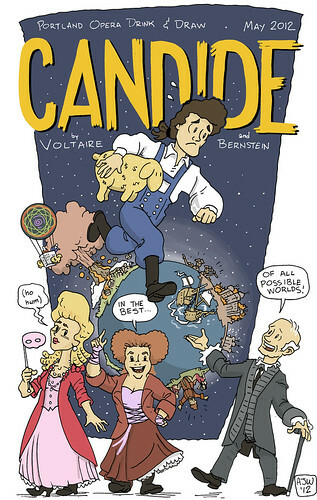 Anyone who is familiar with Voltaire’s Story and Bernstein’s music will not be disappointed. A bit of background to the story may be necessary if you don’t know it. It’s very fast and wickedly funny. Since the action takes place in many locations around the world, the scenery directors have employed some ingenious techniques with projected images, and a stage made of surface like Lego  . *Since 2010 I have attended comic artists’ nights for Hansel and Gretel and Turandot. In addition, I’ve colored some drawings made by my pal S.W. “Conch” Conser who attended an event which I missed.